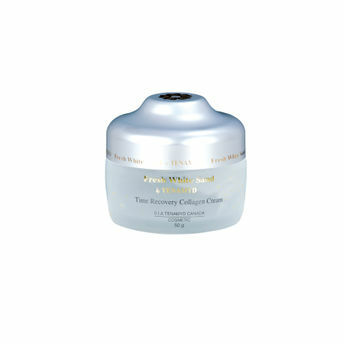 Tenamyd Canada Fresh White Sand Time Recovery Collagen Cream hydrates skin and balances its natural moisture level. As an important skin component, collagen helps regenerate damaged skin cells. This collagen recovery cream improves the elasticity and firmness of the skin and rebuilds its moisture content. It reduces the appearance of wrinkles and the visible signs of aging. Its soft, gel-like texture gets absorbed into the skin easily and stays non-greasy. Additional Information: Tenamyd Cosmetics Canada offers natural beauty and pure confidence. The main ingredients that enhance the quality of Tenamyd Cosmetics are crystallized from rare and well-known natural herbal compounds as well as pearl compounds, diamond powder, and other minerals, in order to give birth to quality products of international standards.